Dance, Festival, Roja Kannan, Drama. She instilled this in us (my sister Meena and I) constantly, ever gently coaxing us into the innumerable activities we pursued in our young days like dance, music, acting and studying in that order. Born in Badagara, a remote town in North Malabar, in Kerala, as the younger of the two daughters of a leading Barrister at Law, Amma was the apple of my grandfather Narayana Iyer's eye. She was spoilt, so to say, to a great extent because her older sister, Thangam, was older to her by almost 10 years. So Amma was the baby of the house where all her wishes were the family's command. Even in that remote town where there was not much exposure to even a radio, she nurtured a passion for the fine arts, especially dance and an old Ravi Varma oil on canvas where Radha and Krishna were shown playing Raasa Leela was her favorite, in front of which she used to dance secretly trying out various movements and moves, to the haunting melody of P Susheela's "Gangai Karai Thottam Kanni Pengal Kootam Kannan Naduvinilay..."
After schooling, she went to the Maharaja's College, Ernakulam, for her undergraduate studies in Chemistry. Being the first in the family to pursue higher studies and staying away from home in the hostel, which was rather revolutionary for a young girl from a Brahmin family those days, Amma was destined to break new ground even from her young days. Marriage brought her into a very traditional and orthodox household at Kalpathy, Palghat, and saw her step into the world of music. Yes, she became the third daughter-in-law of the famous musician Palghat Rama Bhagavathar, in whose house every brick resonated with music. Soon after marriage, my father MR Venkatramanan moved to Chennai (then Madras) for starting his career. This was the time for Amma to continue her artistic dreams and pursuits, not for herself, but for us, my sister Meena and I and Madras was the place for all this to start. At that time, Sarasa Teacher was living next door to our home in Abhiramapuram. Teacher saw my sister Meena who was just three then and said, "She can't even walk now and you want me to teach her to dance; come after a year or two." Amma was not convinced. Vyjayanthimala's Natyalaya was down the road. We went there and got admitted. Kavi Aravindakshan, Adyar Lakshman, Trichur Ramanathan and Madurai Krishnan were all there and were really impressive. The classes continued for four to five years, amidst raised eyebrows and behind the closed door murmurings in the family. But Amma was like a rock. Even when I used to cry in pain at nights because of pain in my weak limbs with Appa chiding her for letting me go through this, she did not want to give up. The lessons continued with Aravindakshan and in 1972, our Arangetram was conducted at the RR Sabha with the most impressive orchestral line up - Kavi Aravindakshan and Adyar Lakshman wielding the cymbals, Madurai Sethuraman on the vocals, Trichur Ramanathan on the mridangam and none other than the great Padma Subrahmanyam as the Chief Guest along with Justice Krishnaswamy Reddy. At school we were treated like stars because we were the official dancers of the school. We were dancing for anything and everything and we were seen 'more' in dance rehearsals and 'less' in the class. But that did not mean we were any 'less' in studies. We were recipients of the Merit Card, year after year, at the School Annual Day and we used to always receive it with dance costumes and alta and never in our uniforms. Both of us were School Pupil Leaders in our school - St.Antony's Girl's Higher Secondary School. I took to the Arts and pursued my Masters in Sociology while my sister Meena turned to Science and went abroad to pursue her Doctorate in Medical Microbiology. She is now a Senior Director (Clinical Science and Technology) in a famous bio company, Biogen Idec in Boston. 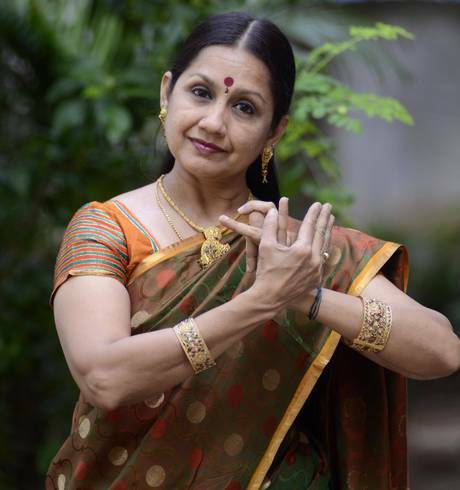 She continues to run regular Bharatanatyam classes there and has many students. All along, the practices in the dance class and performances all over India never stopped. Time management was Amma's forte. We never wasted a single minute even during our summer holidays, when we were busy acting in child roles in movies like Kannay Paapa, Raman Ethanai Ramanadi, Nilavay Nee Saatchi, Gnana Oli and so on. Amma saw to it that our lessons in Carnatic vocal music continued with the same vigor as dance. 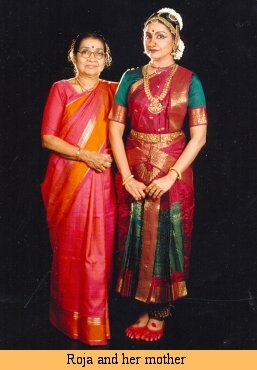 Since we were referred to always as Palghat Rama Bhagavathar's granddaughters, Amma saw to it that we kept up the family name intact and satisfied the elders in Appa's family by proving that we could sing as well as we could dance. At 72, Amma is still my most efficient PRO, manager, dietician and my worst critic. Till date, she has never said that I have danced 'well' - but I am not upset because of this. It motivates me to prove myself more and raise the bar a little higher each time I dance and to aim higher and improve my caliber as a good artiste. After a long break of 13 years, if I have comeback to mainstream performance, it is all because of Amma - who is still constantly guiding, coaxing, goading, chiding and leading me. Amma, I owe it all to you and wish to be born your daughter in all my births.